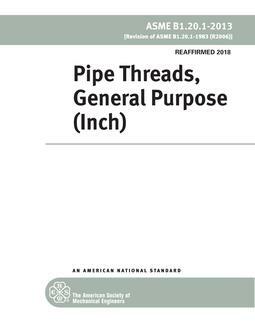 This Standard provides dimensional tables for external and internal plastic flow interference- fit (Class 5) threads of modified National thread form in the coarse thread series (NC) in sizes 0.250 in. through 1.500 in. 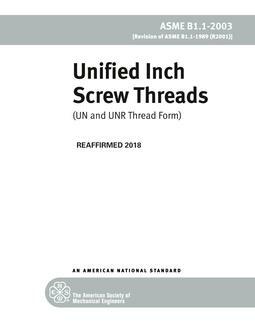 This is not the ANSI B1.1 UN thread form. It is intended that designs conforming with this Standard will provide adequate torque conditions which fall within the limits shown in Table 8. 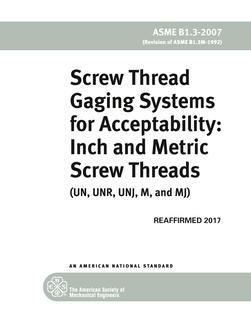 The minimum torque is intended to be sufficient to insure that externally threaded members will not loosen in service, the maximum torque establishes a ceiling below which seizing, galling, or torsional failure of the externally threaded components is reduced. This Standard provides for the maximum allowable interference. Appendices A,B,C, and D contain useful information that is supplementary to this Standard, such as reprints of the obsolete tentative and alternate Class 5 standards, US Navy ship specifications for elastic interference-fit coarse thread series from 0.250 in through 2.000 in, US Navy ship specifications for Class 5 Modified which includes nickel-copper-aluminum alloy external threads, and an interference metal comparison of standard to nonstandard interference-fit threads.